Jesse Thayer, Brandon Lowery and Nathan Foley coax the steel base of one of the three Freedom Summer Chimes. Madeline Haigh paints text on tree trunks. 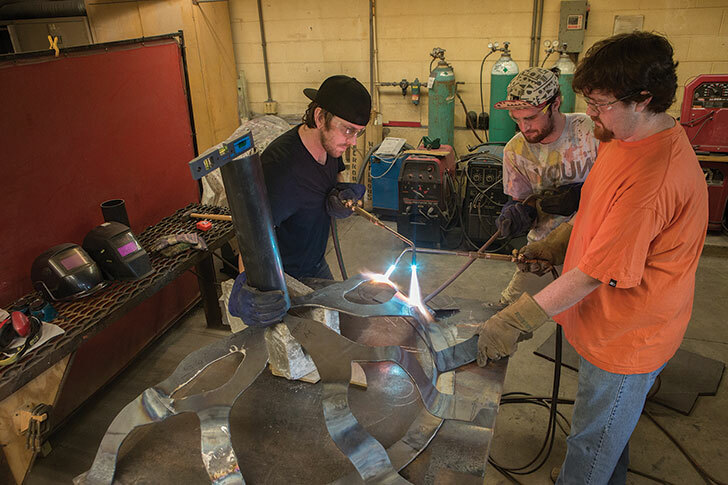 Nathan Foley MFA (Miami '14), Jesse Thayer (Miami '14) and Brandon Lowery MFA (Miami '16) spent a good part of their summer shaping sheets of steel. The resulting treelike structures are the Freedom Summer Chimes. Madeline Haigh, a senior majoring in art, later painted text on the tree trunks. Thayer answered questions about the project as the three coaxed the steel base to bend. The chimes will be unveiled during a dedication ceremony at 1:10 p.m. Sunday, Oct. 12, at the Freedom Summer Memorial. Q: How will the chimes be incorporated into the existing Freedom Summer Memorial? A: The 10-foot-tall sculptures will be placed on the southwest side of the memorial’s three dogwood trees. The idea is that the chimes’ metal branches will intertwine with the real trees as the dogwoods grow. The chimes are to be like a shadow of each tree. Q: Why three trees and three sculptures? A: We’re keeping to the three theme to remember James Chaney, Andrew Goodman and Michael Schwerner. They were murdered in Mississippi after leaving Western College’s voter registration training in June 1964. The Freedom Summer Chimes will be unveiled Oct. 12 during a special ceremony at the Freedom Summer Memorial. Q: That’s why the chimes are facing southwest? A: Yes, they’re facing Mississippi. Q: Biggest challenge on this project? A: Working so far from the site. The memorial is next to Kumler, but we’re in the basement of Hiestand. You usually work on a sculpture on a flat floor, but these will have to sit on a slope around each tree’s root ball. Q: Are they hard to move around? A: Yes, they’re heavy. Once they’re welded together, they’ll be 500 pounds apiece. Q: So, it’s not easy to take each sculpture to the memorial to test how it’s fitting? A: We’re used to moving heavy things around, but this is big and awkward. We’ve put marks on the cement floor in Hiestand to indicate the root ball of each tree and are shaping the base of the sculptures around the marks. 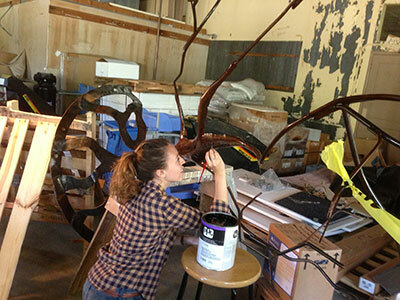 Each sculpture has a big ring for the base that will be set into the ground and covered up. The chimes will hang from the upper metal branches. Q: Any idea how the sculptures will meld with the trees? A: Nobody knows yet. 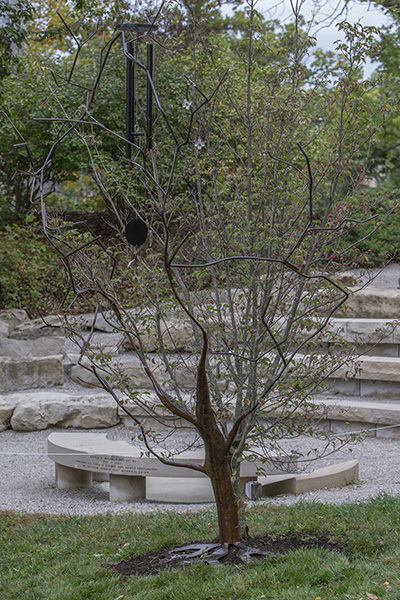 Will the tree grow into the metal and absorb it or reject it? Everybody is learning on this project.